Following Atilla's untimely death resulting from an assassination plot, the German tribes of the Hun Empire turned against the Huns. Fierce battles ensued. One of the Hun tribes, the Székely people of Transylvania, stood guarding the Hun positions in the Eastern Carpathians while Atilla's sons led the military campaigns against the enemies of the Hun Empire. Csaba, Atilla's youngest son promised the Székely people that he would return with reinforcements from the East to protect them against the enemies of the Huns. This he did on several occasions as the neighbouring peoples continued their aggressions against the Huns. 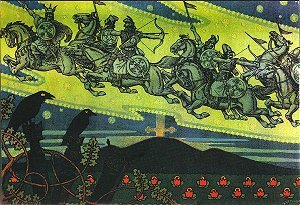 Even long after Csaba had joined his ancestors among the stars of the heavens, his army of invincible Hun warriors returned from the other world along the starry path of the Milky Way, which the Hungarians call "Hadak Utja", the road of the warriors, in order to defend the Székelys. 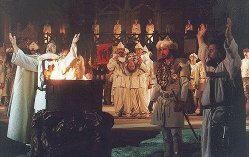 This story represents the firm knowledge that the Huns will return to protect their kinsmen against foreign aggression, and their determination never to give up the Carpathians: this region was the heart of the Hun Empire and had always belonged to their kind.